(Phys.org)—A team of researchers working at Philipps-Universität Marburg, in Germany has created a new kind of material that is able to convert a near-infrared laser beam into a visible beam of light. In their paper published in the journal Science, the team describes the material, how it was made and the possible ways it might be used. Scientists have created many materials that are able to serve as conduits for converting infrared light to visible light, but such devices have generally resulted in producing scattered visible light, and more often than not they were complicated or expensive as well. 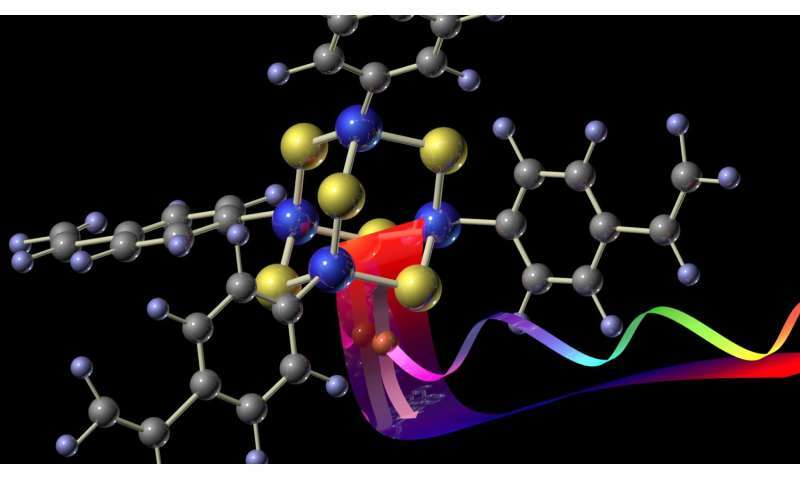 In this new effort, the researchers have created a material that is inexpensive (it is mostly inorganic nanocrystals), easy to create and produces a straight-line beam moving in the same direction as the original source. The material was made from a mixture of sulfur and tin atoms (sourced as a powder) which had been fashioned into a diamond shape and finished with a coating of organic ligands to provide structure—when an infrared laser was directed at the material, the invisible light was directed through the material in such a way as to alter its wavelength, without changing its direction. The result was a beam of visible light, such as might be seen emanating from a flashlight. In this instance, the light was softer however, as the team describes it as the sort that might normally be seen with a tungsten lamp. Testing has also indicated that the quality of the visible light can be fine tuned by adjusting the laser that is used to provide the infrared beam. The researchers also note that the material is sturdy as well, able to withstand temperatures as high as 572° F.
Because of its directional qualities, the team suggests the material might prove useful as an add-on to applications that requires use of a microscope, or other applications or where light is needed for projection, such as onto a screen. And because it is also cheap, scalable, is not volatile and is stable in air, it could very easily make its way into already established applications or devices. Tailored light sources have greatly advanced technological and scientific progress by optimizing the emission spectrum or color and the emission characteristics. We demonstrate an efficient spectrally broadband and highly directional warm-white-light emitter based on a nonlinear process driven by a cheap, low-power continuous-wave infrared laser diode. The nonlinear medium is a specially designed amorphous material composed of symmetry-free, diamondoid-like cluster molecules that are readily obtained from ubiquitous resources. The visible part of the spectrum resembles the color of a tungsten-halogen lamp at 2900 kelvin while retaining the superior beam divergence of the driving laser. 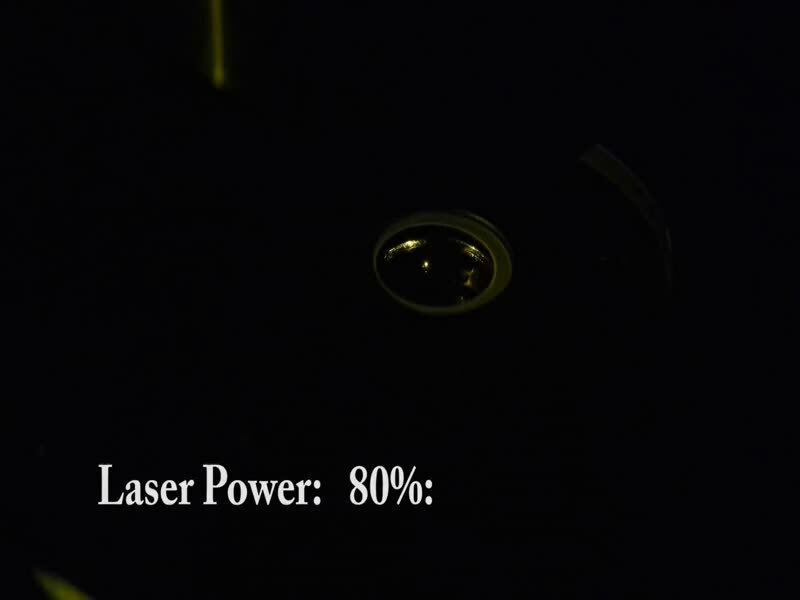 This approach of functionalizing energy-efficient state-of-the-art semiconductor lasers enables a technology complementary to light-emitting diodes for replacing incandescent white-light emitters in high-brilliance applications.